On the Cover: Sand Islands and sand bars of the Wisconsin River deltaic complex, near Wisconsin Dells, Wisconsin. Photo by Carl Guell, submitted by Mark and Todd Fonstad. Learning with Geographic Information Systems (GIS) rather than about GIS has great potential for improving students' skills in problem solving, analysis, and spatial visualization. However, little is known about how well GIS-based learning lives up to this potential. Using classroom observations, student interviews and surveys, pre- and posttests of knowledge, and measures of spatial skills, we have begun to quantify student learning that occurred with a GIS-based module on plate tectonics and geologic hazards. We also investigated factors in the design and implementation of the materials that impacted student learning. Classroom observations were key to improving the materials so that students in an introductory geoscience course can successfully complete the activities with minimal instruction in GIS. Through field-testing, we improved the materials design to address student difficulties with learning to use a GIS, identifying basic geographic locations and features, and interpreting topography and other two- or three- dimensional representations. In a quantitative measure of knowledge, using pretests and posttests, mean scores improved 17% (p<.001). We also found positive correlations between students' spatial ability and performance on both the posttest and a regular course exam that covered the material in the GIS activity. We are continuing this investigation in Fall 2001 to measure changes in spatial ability due to use of GIS-based materials. We are studying changes in knowledge of science and attitudes regarding science among participants in a summer Research Experiences for Undergraduates program run by the Atlanta Consortium for Research in the Earth Sciences. Existing survey instruments do not detect changes in our participants' attitudes over the course of our program and also fail to detect differences between our geoscience faculty and a group of college students with limited exposure to college level science. Therefore, we are developing a new survey instrument based on clusters of statements representing a variety of philosophical positions, from which respondents must pick one statement. We compare the distribution of the choices made by a group of respondents with the distribution of choices made by geoscience faculty. The first version of the instrument was able to differentiate between three different groups of students with different science backgrounds. Some of the statement clusters detected changes in our RUE program participants' attitudes over the course of the program. We believe that with further modification, an instrument can be developed that will detect changes induced by participation in a research experience. We have also studied the use of open-ended questions regarding the nature of science. Statistical analysis of responses to open-ended questions can also differentiate between college students with different science backgrounds and detect some changes over the course of our program. Reuse of educational materials is integral to many educator tasks, from designing a course to preparing for a lab or class. We are studying the reuse of educational materials in the context of the Digital Library for Earth System Education (DLESE). DLESE is a community-owned and governed facility offering high-quality teaching and learning resources for Earth system education. Our studies build on a cognitive framework that posits that people engage in three cyclical processes-location, comprehension, and modification-when reusing resources from large digital repositories. Our formative evaluations and cataloging experiences in DLESE suggest that the 'findability' and reusability of community-created digital educational resources is highly dependent on the presentational and structural design of the resources themselves. Educational resource designers often do not develop components with reuse in mind, making it more difficult or impossible for other educators to find and use their material. We share the results of these studies to help educators create digital materials that are more easily shared and used by others. For example, we recommend that all resources clearly state the creator's name and contact information; relevant copyright restrictions; the most significant date for the resource (specifying creation or revision); and the intended grade level. Students hold a surprising number of misconceptions about how rocks form. This study analyzes narrative essays - stories of rock formation - written by pre-service elementary school teachers. Most students had completed a college-level course in earth science, yet expressed startling misconceptions, including pebbles that grow, human involvement in rock formation, and sedimentary rocks forming as puddles dry up. These misconceptions arise from deeply held but largely unexamined beliefs, called here conceptual prisms. Conceptual prisms result from the interaction of the student's world view and personal experiences. These beliefs are largely unaffected by traditional science instruction. Instead, students experience instruction refracted through their conceptual prisms, resulting in a spectrum of student ideas about geology. Instruction that does not explicitly address misconceptions and the underlying conceptual prisms is likely to be ineffective. The purpose of this paper is to present the methods and results of our assessment of students' scientific writing. This study was conducted in an introductory oceanography course in a large public university that used an interactive CD-ROM, "Our Dynamic Planet." The CD-ROM provided students with geological data including earthquake locations and depths, volcanic locations, topographic elevations, heat flow distributions, and the relative age of islands which they may use to build their arguments regarding plate tectonics. We examined 24 student papers from this course and analyzed the quality of their written arguments by using two methods: (1) a grading rubric and (2) an argumentation analysis model. Quantitative analysis comparing the assessments made by these two methods produced disparate results. Through the presentation of samples of student writing, we demonstrate the application of the argumentation model. Finally, we discuss ways of using argumentation to help students understand how to tie data to theoretical assertions and to provide ways for students and teachers to assess the uses of evidence in scientific writing. The constructivist approach to science education is recognized as a valuable approach for building deep student understanding of scientific content and inquiry. Implementation of constructivist teaching practices in specialized courses in geoscience for pre-service K-6 teachers is especially critical to model good pedagogy and familiarize future teachers with an inquiry-based model of teaching and learning. We introduced a constructivist approach in two teacher-training courses in the Spring 2000 semester and assessed their resulting content knowledge with examination-based assessments. Contrary to expectations, the change in teaching style led to a dramatic decrease in student performance. Further revision of the course in the subsequent semester based on analysis of test responses and student comments led to a new curriculum with reduced content breadth and greater emphasis on scaffolded, inquiry-based exercises which built understanding gradually and with reinforcement. These changes resulted in modest performance gains in Fall 2000 sections. We conclude that the implementation of constructivist teaching must 1) allow enough time to address prior conceptions and facilitate students' incorporation of new ideas, 2) limit the breadth of content taught, 3) explicitly introduce students unfamiliar with scientific inquiry to methods they will use to learn the content, and 4) take steps to avoid the common pitfalls of group work. The use of computers and the Internet to convey content to students is popular, but the amount of research relating the effectiveness of the technology to learning the information is relatively sparse. Data on exam performances and attitudes toward the use of technology were collected from large enrollment, entry-level Geoscience courses over a span of seven semesters. The data were examined to determine if the use of computers as a presentation tool and the incorporation of the Internet as a means to give students increased exposure to course content (notes) increased exam scores and knowledge of Earth Sciences. Most students (80-86%) found the web-based notes useful. Average exam scores improved by as much as 23% when the Internet was used to get information to the students in combination with computer-driven lectures, in class discussions, and applied information reports. Comprehensive final exam scores improved by an average of 11%, suggesting better preparation for exams, and more retention of course information when compared to a representative non-enhanced class. In enhanced classes, up to 86% of the students passed, compared to only 57% of students in the class taught without the benefit of technology. 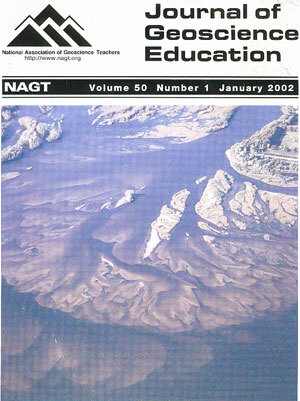 A scenario-based assessment tool used in two environmental geoscience in-service programs for middle school and high school teachers served both to guide instructional techniques and as a method to evaluate the success of the instructional approach. In each in-service program the participants were assessed at an initial meeting to determine their understandings of environmental problems. The assessments included a hypothetical watershed scenario in which participants had to choose water quality monitoring sites, monitoring parameters, and provide justification of their choices. The results of these pre-assessments provided staff with an understanding of participant misconceptions that could be addressed specifically in program activities. In each program the participants were given the same assessment after participating in the workshops and this revealed significant shifts in certain areas of their understanding of watershed quality concepts and monitoring approaches. Good assessment scenarios are complex and are based on accurate information or data that are used to answer a question or prompt. They are particularly revealing and valuable because they ask students to make decisions by applying their understandings using information or data. Development and use of scenario-based assessment in this program came about only because of genuine and sustained cooperation between science education faculty and geoscience faculty. This highly beneficial collaboration was key to providing quality training to participating in-service teachers, and development of a synergistic teaching and learning environment. Consensus regarding criteria for academic excellence in geosciences is an important component in developing K-16 geoscience study that can lead to 1) general geoscience literacy for personal and social decision making and public support of geoscience research, and 2) strengthening depth of understanding for geoscience majors. A synthesis of criteria for academic excellence in geosciences is derived from the criteria for excellence developed by scientific societies including National Research Council/National Academy of Sciences documents which address K-16 education in the sciences and geosciences. National professional organization reports corroborate the scientific societies' criteria. By identifying and synthesizing the learning goals in these documents a succinct set of criteria for academic excellence in the geosciences is developed. Using the Geoscience Academic Excellence Model derived from the synthesis it is possible to evaluate the excellence of academic documents involving the study of geosciences K-16. Geosciences departments are encouraged to develop their own curriculum alignment with the criteria and to assist state and local K-12 science education policy in achieving the same level of excellence.